Our brains are an amazing organ! And just like our bodies, our brain functions best when it's put to work. 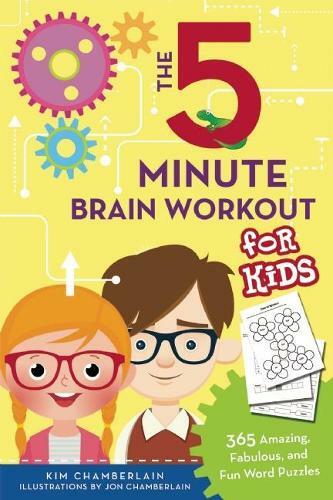 So get ready to give your brain a full workout each day with The Five-Minute Brain Workout for Kids! Inside, you'll find 365 word puzzles and games to keep your mind active and in great shape! Have fun with your family and friends as you learn about acronyms, anagrams, definitions, parts of speech, rhyming words, syllables, word structure, and more with these fun puzzles. From Alphabet Teasers and Mini Word Sudoku puzzles, to Speed Words and Word Store games, even doing one puzzle a day will help you to learn new words, spell better, problem solve with ease, and have better concentration. With ten levels of puzzles ranging from easiest to most challenging and an answer key at the end to check your work, this book is sure to help keep your brain active and will help increase your understanding of and love for all kinds of words! So impress your family and friends by how quickly you can solve word puzzles and with how many words you've learned, too! This is a fabulous word puzzles book with over 400 various puzzles ranging from easy to difficult. Parents and teachers will like this as an educational way to keep kids occupied and learning important words and phrases. The graphics throughout make it kid-friendly and lessen the emphasis on learning, which should pull kids in.